Increase revenue or program cuts. That’s the choice New Brunswickers currently face but they are not alone. Many other provinces including oil rich Alberta, with a potential $6 billion deficit, are facing the same problem. New Brunswick’s focus seems to be on raising revenues. An admirable task, no doubt, but how much revenue to raise and from where? As for how much, we, the people, do not know but, fear not, neither does the Alward Progressive Conservative government! Finance Minister Blaine Higgs initially projected a $183 million deficit for the 2012-13 fiscal year. This doubled to $356 million in November of 2012 and, in February 2013, the projected deficit jumped to $411 million. What will it actually be by the end of the fiscal year? Who knows? Our leaders certainly don’t! It seems we are playing roulette with the provincial deficit which is certainly not a desirable way to run a province. New Brunswickers deserve better! Which brings us to question from under what rock shall we find the money? Premier Alward as does former Premier McKenna firmly believe the answer lies in shale gas and in an oil pipeline connecting Montreal to the Irving refinery in Saint John to process Western Canadian tar sands. But shale gas is fraught with problems. On the regulatory side alone, there is something seriously wrong when the New Brunswick government thinks it can put in place stringent regulations to ensure development of the shale gas industry in an environmentally friendly way. What makes it think it, as a province of about 750,000 people, can effectively regulate the industry when the states of New York, Pennsylvania, Ohio, Colorado, Michigan, Texas and many others with much greater populations and elaborate environmental regulatory frameworks have failed? Only in dreamland, otherwise known as New Brunswick. Don’t get me wrong. There is nothing wrong with looking for extra revenues and perhaps we should even move forward on the above projects. However, to think we can solve our deficit problems by finding more revenues alone whether by shale gas development, oil pipelines or by raising taxes is naive and misses the point. Put differently, it is like trying to lose weight by loosening our belt. Yes, we feel some initial relief but eventually we gain more weight and the belt once again feels tight because we have not solved the problem which is overeating. The same thing applies to New Brunswick’s deficit. More revenues solve little because we have not addressed the source of our problem: our spending habits! It is time to cut the credit card. In other words, it is time for New Brunswickers to have a sober discussion about the type and level of services we can afford. Everything is on the table for discussion. So, what services do you want cut and by how much? What a difference a couple of weeks on the campaign trail can make. The Parti Quebecois (PQ) had a comfortable lead in the polls through the first week and during the televised debates. Then things went south for Pauline Marois and the PQ before rebounding a bit. Immediately after the debates, Marois publicly mused about her winning a PQ majority and what she would do with it. Typically when this happens, voters get turned off and run to the other parties as it comes off as being arrogant and out of touch with the public. The xenophobic overtone of some of the PQ policies to enhance French culture has not done the PQ party any favours. Confusion over how a referendum on Quebec sovereignty would be triggered has further complicated things. Marois has wavered on this saying that it would be the people who would decide if there is to be another referendum while at other times saying that is at her discretion only. Talk about undermining the PQ’s populist’s orientations! Jacques Parizeau entered the election fray and, somehow, you knew he would. He has to stir the pot and that he did in throwing his support behind the upstart hard-line sovereigntist party Option Nationale. And these are just the highlights! The result has been a steady erosion of PQ support to the CAQ party which surpassed the Liberal party as the party of second choice for Quebecers. At one point, the PQ was only 5 points ahead of the CAQ and in definite minority government status. But, Marois is not new at this having been in provincial politics over three decades. She has also held numerous cabinet posts in former PQ governments. So, what has she done to turn things around? Two things: First, she has reverted to the “us” against “them” line of argument. That is, Quebecers against the rest of Canada to drum up support and to deflect attention away from her own party’s problems (a.k.a. the Danny William’s move). It is amazing that this tactic works to the degree that it does. I mean, given Quebec has continually claimed at least half of the equalization payments from the federal government since the program’s inception in the late 1950s yet has never been able to develop a robust economy undermines the argument that the problem lies with the Canadian federal government. This is, of course, unless one blames Canada for not weaning Quebec off of equalization payments long ago! The question is: When are Quebecers going to look in the mirror to find the source of the problem? Second, Marois also seized on Quebec’s deep social and environmental conscience and announced that she would cancel the loan guarantee for the last asbestos mine in Quebec which would effectively shut it down. So, have Quebecers responded? Yes. The PQ has once again been rising in the polls to the point where with four days left in the election, they are within a point of a majority government status. The trend line for the PQ is good right now but there is no guarantee it will hold until election day. On the other hand, the CAQ appears stalled in support while Jean Charest’s Liberals are free falling. In a way, it is sad to see Charest’s Liberals flailing around. All that is missing is the final coup de grace which may be coming, and with Charest increasingly looking like even he will lose his seat, on the 4th of September when voters go to the polls. But....will it be a PQ majority or minority? Towards a PQ majority...and burying separatism? Last night’s one-on-one debate between Québec Liberal Jean Charest and Parti Québécois leader Pauline Marois was interesting for what did not happen and for what might happen. Charest needed to bury Marois in the debate, you know, deliver a knockout punch, and that did not happen. Rather, Charest looked like an ill-tempered child rebelling against his parents with the parents staying calm throughout the process. Marois was excellent at maintaining her composure and in casting doubt on Charest and his Liberal party. This does not bode well for Charest. He is increasingly following in the footsteps of former Prime Minister Paul Martin who in the wake of the Gomery Inquiry was turfed into the abyss. [Message to Ontario Premier Dalton McGuinty: You are on this path too!] Charest is sinking and sinking fast. So, should Quebecers be concerned if they wake up to a Marois led PQ government the day after the election? No, not at all. In reality it may be the best thing that can happen. Let’s face it, this would ferret them out of the woods, let them have their referendum and then bury them for the next century. How so? Well, it’s like an earthquake. Before an earthquake happens, several tremors typically occur. Warning signs in other words. Then, the earthquake happens causing havoc and much environmental and human damage. Finally, several aftershocks follow before we fall into a new period of relative and lengthy tranquility. What does this have to do with Québec politics? For one, the similarities are interesting. We’ve had lots of warning signs or tremors. For example, the rise of Québec nationalism during the Quiet Revolution, nationalization of industries, the FLQ crisis, the formation of the PQ party in the late 1960s and their election in 1976 come to mind. We also experienced the earthquake: the 1980 referendum with the NO side winning a good majority. Then came the aftershocks which include the patriation of the Constitution against Québec’s wishes, the subsequent failures of the Meech Lake and Charlottetown Accords, and the 1995 Referendum where the NO side won again, even with a “muddied” question. Now we may be set for another aftershock with another referendum if the PQ wins this election. This may not be a bad thing given time between aftershocks tends to lengthen suggesting that after the PQ referendum, it will take even many more years for any uprisings to occur. And, make no mistake: If the PQ wins, they have to hold a referendum or risk perpetual irrelevancy and replacement by other parties (a process already underway with the rise of the Coalition Avenir Québec and Québec Solidaire). Yet it is this referendum that the PQ cannot win. Québec simply does not have the finances to go on its own. The fact Québec has continually been the largest recipient of equalization is proof enough of this. Moreover, Marois estimates her PQ party promises at about $1 billion dollars. How are Quebecers to finance that....and don’t say equalization now, especially when the desire is to be a separate country? At the very least, this should give Quebecers cause for concern! Combined with Québec’s high debt level, a referendum win is simply not in the cards (not to mention Quebecers don’t want separation but strong and effective representation in federal institutions). In the end, Quebecers do not want a referendum but are seeking good governance much like they were in 1976 when the PQ originally came to power. Ironically, it may be a PQ win on September 5th that gives them their last kick at the can for a very long time! Separation tranquility may be on the horizon. In the meantime, we have to witness Charest’s undoing, a painful sight to say the least. B.C. Premier Christy Clark is absolutely right to demand a greater share of the oil revenues for allowing the Northern Gateway oil pipeline to go through B.C. over to the Pacific Ocean. Simply put, oil pipelines leak, seemingly with increasing frequency and often in places that are difficult to access. It doesn’t help that oil companies have been at times slow to respond, often with insufficient measures. We can point to numerous examples as proof such as the hundreds of thousands of litres of oil that spilled into the Kalamazoo River in Michigan last year, and numerous recent oil spills in Alberta including large spills of 230,000 litres near Elk Point, 800,000 litres near the Northwest Territories border and up to 480,000 litres under the Red Deer River. A cynic could argue that pumping oil in pipelines is akin to pumping it through Swiss cheese—it’s going to leak! The questions are when and how much? So it makes sense for Premier Clark to demand more revenue. The problem is Alberta Premier Alison Redford wants nothing to do with providing additional revenues to B.C.. According to Redford, the Northern Gateway project is in the national interest and so should be built. To provide compensation to B.C., she states, would be fundamentally changing the Canadian constitution or how Canada works. Redford’s attempt to label the project a “national” one is fraught with difficulty for the Harper Conservatives. If Harper were to declare it a national project, he would be leaving himself open for litigation from Newfoundland and Labrador which has long made similar claims in regards to Churchill Falls. Moreover, it would further cost the Harper Conservatives what few precious votes they have left east of Ontario and drive a wedge in his support in western Canada, one he can ill afford given the lukewarm appeal he has to Ontarians and rejection from eastern Canada. The best thing Harper can do is to work behind the scenes to bring Redford and Clark together and encourage them to strike a deal. Moreover, Redford is wrong on this as the Newfoundland and Labrador case reveals. Power from the Churchill River in NL flows through Quebec for which NL is compensated, albeit poorly. Likewise, NL has struck a deal with Nova Scotia to build an underwater cable to transmit electricity to the mainland when Muskrat Falls comes online. In both cases the similarities are striking. Newfoundland has a resource that needs to get to market and it needs to cut a deal with other provinces to get it there given it cannot do so on its own. Alberta faces a similar situation. It is landlocked with no sea ports and it too must figure out how to get the heavy crude to market. It can ship it via transport trucks yet that would be extremely costly. Pipelines make more sense but shipping it north to Arctic ports is risky given the permafrost, sea ice and icebergs. Shipping it south through the U.S., the Keystone Project, is stalled. It will likely eventually get built but that could take years. What about shipping it east? That is possible but not the best choice given limitations of current pipelines and difficulties in going that distance given the many provincial and federal approvals required. So, west looks best! But…..Redford wants to do it at no or the least cost to Alberta. That’s not reality. Redford needs to strike a deal with B.C. fast to get all that production coming online in the next few years to market. One possibility would be to divide up the royalties/revenues according to who shoulders the greatest risk. This means B.C. needs a much larger share. Alternatively, a deal could be struck that if an oil spill occurs, those that gain the most via royalties/revenues would pay the most for repairs and rehabilitation. So if an oil spill did occur in B.C. and Alberta receives, for example, 90% of the royalties, then Alberta would be on the hook for 90% of the costs to pay for the repairs and for environmental rehabilitation. This simply makes sense in that those that profit the most pay the most. The NDP must be feeling pretty good these days given the latest Environics poll from Newfoundland and Labrador. Federally, the NDP is at 49% support, well ahead of the Liberals at 34% and the Conservatives with 17% support with most of this support concentrated in the Avalon region. This is a surge of 16% for the NDP since the federal election in May 2011 with a slight drop in support for the Liberals and an over 10% drop for the Conservatives. Similar results can be found at the provincial level though they are less dramatic. Provincially the NDP are leading the other parties for the first time in their history with 38% support followed by the Progressive Conservatives at 35% and the Liberals at 26%. While the gains by the NDP are significant, perhaps the losses by the Dunderdale Conservatives are more interesting given they have lost 21% support since the October 2011 election. The questions are: Why are the provincial Conservatives bleeding support and should they be worried? The answer to the first question is straightforward while the answer to the second question is mixed. The Dunderdale Conservatives have lost support for two main reasons: the policy decisions of their federal counterparts and their poor performance to date. Let’s face it; the Harper Conservatives have done little to cultivate Conservative support in Newfoundland and Labrador. In the past six months alone, they have made cuts to fisheries enforcement activities, cuts to fisheries scientific research, cuts to Parks Canada scientists and staff and cuts to Service Canada workers including moving the office from Gander to Fredericton, New Brunswick. If that was not enough to make Newfoundlanders despise Conservatives, the search and rescue boondoggle should do the trick. How can one ever justify the federal Minister of Defence being ferreted around on personal salmon fishing trips while search and rescue services cannot be sent out to find a lost Burton Winters in Makkovik? The short answer is that there is no justification, on any grounds, and if they think they can justify such action, then, in my opinion, they are seriously deluding themselves. We should also not forget the proposed changes to the Employment Insurance program which will make it more difficult for people of this province to access EI benefits, the rationalization of Coast Guard service in Halifax along with the privatization of light houses. Indeed, the Harper Conservatives do not have a pro-Newfoundland agenda! That is a lot of baggage for the Dunderdale Progressive Conservatives to carry, all in the hopes of obtaining a loan guarantee for Muskrat Falls. The question is: Is it worth it? But the Dunderdale Conservatives have had their own issues. Not calling the House back for several months after the 2011 election was a mistake. Even if you do not like debating issues in the House of Assembly, as Dunderdale does, one needs to find a better way of handling these matters. A similar situation exists with the plan to allow members of the House to debate Muskrat Falls but to not hold a vote on it. Adroit governance rather than avoidance is needed here. You can also point to the lack of progress on fisheries restructuring and rationalization with the Dunderdale Conservatives preferring to let natural attrition do government’s work. In one sense, it seems they may have written off the fishery but refuse to officially announce such a policy direction. Certainly our fisherman and rural Newfoundland deserve better, much better. The proposed draconian changes to access to information which would see much less information, even factual information, not made available to the public, and to the province’s Auditor General, and largely be at the discretion of the Minister has not helped matters. This effectively takes Newfoundland and Labrador to Third World country status on this aspect and begs the question: What are the Dunderdale Conservatives trying to hide (for example, Muskrat Falls details)? Complicating matters is the poor response by the Premier herself, Kathy Dunderdale, to the changes imposed by the Harper Conservatives. To say the least, the responses have been rather pedestrian and unengaging, unlike her predecessor, Danny Williams (though admittedly this is a high threshold to pass). More is required on this front especially given the Conservatives have formed the government since 2003. This is a long time to be in office and usually about when people begin to tire of governments and seek change. So, this should all be good news for Lorraine Michaels and the NDP given their surge in the polls, but it is not. The next election is just over 3 years away. This a very long time and much can happen before then. Witness what has happened in the last 9 months! Can the NDP sustain such support? Where do they go from here? Only time will tell but rest assured, the Dunderdale Conservatives have plenty of time to rebuild support for their party. A strong economic program will do much to bring people back especially if balanced budgets form part of the equation. The ball is squarely in the Conservatives court. Now, what do they want to do? How interesting to see the fishery was a non-issue in the 2011 Newfoundland and Labrador election on October 11. This is interesting in the sense that for years the fishery was the backbone of the provincial economy. Certainly there is no shortage of problems that need to be addressed including industry downsizing and restructuring of the industry. Yet fisheries issues were conspicuously absent during the election campaign. Rather, the 2011 election campaign was dominated by other issues such as health care (~26%). Unfortunately, polls made no distinction between urban and rural areas of the province which may have had different priorities. For instance, while health care issues may cut across the population equally, fisheries issues remain a largely rural issue. Combined with the rapid development of the aquaculture industry which benefits only some rural areas such as the south/southeast coast and the north coast (Twillingate) areas, the continued rural out migration and general health of the economy driven by the oil and gas industries, it may be easy to see how fisheries issues failed to gain traction. Yet such an interpretation may be misleading. Other factors may be at play such as the deliberate suppression of the issue by the Dunderdale Conservatives. Note, that Dunderdale refused to discuss fisheries issues during the election. For example, on one occasion, fisheries workers confronted both Dunderdale and Fisheries Minister Clyde Jackman about the ongoing plant closure in Marystown to no avail. Perhaps the lack of discussion was due to the fact Jackman was facing tough opposition in the election from Julie Mitchell of the Liberal Party. Mitchell was the Deputy Mayor of the largest town in the district, Marystown, which is home to a ship building yard and a fish processing plant. The suppression of the fisheries issue no doubt aided Jackman squeak out a narrow 40 vote victory in the election. Interestingly, less than twelve hours after the election, Dunderdale announced that she would quickly move to restructure the fishing industry. One day later, the Department of Fisheries and Oceans Canada announced it was proceeding with budget cuts of 56.8 million dollars for 2011-2012. Was such news suppressed to benefit the provincial Conservatives given Dunderdale had enthusiastically supported Conservative Prime Minister Steven Harper in the 2011 federal election campaign? One only wonders. The way the issue played out in the 2011 campaign proved to be good politics for the Dunderdale Conservatives to “manage” the issue to their advantage. One surely cannot blame them for doing that. Yet where does this leave the harvesters and plant workers? What to make of the 2011 Newfoundland and Labrador election? The results were clear. The Progressive Conservatives under leader Kathy Dunderdale won 37 of the 48 ridings. The Liberals led by Kevin Aylward remained the official opposition garnering six seats while Loraine Michael’s NDP won 5 seats. From a political party perspective, some interesting dynamics emerged. The Dunderdale Conservatives remained firmly in place even though they lost 7 seats (entering the election, the Conservatives had 44 seats). Perhaps this is due to the simple fact the party had nowhere to go but down given they virtually owned the previous House (44 of 48 seats). More likely, it is largely due to the resignation of hugely popular former leader Danny Williams. Dunderdale, and most other leaders, can only dream of such popularity! Still, one would have expected a bit more from the Conservative “machine” given the robust economy and fragmented state of the Liberal party. To be sure, the Conservatives ran a strong campaign with a very controlled messaged. For Liberal leader Kevin Aylward, the election results were bittersweet. On the one hand, losing his seat was no doubt painful. It was Aylward, aferall, who assumed the party’s leadership two months prior to the election after former leader Yvonne Jones resigned for health reasons (though she stayed on to run in her riding and was re-elected). It could be argued that it mattered little who led the Liberals given the timelines. On the other hand, the Aylward Liberals did manage to retain official opposition status and double the party’s seat count. Still, more was expected. And, with having won only 19% of the popular vote, the Liberals now find themselves in third place behind the NDP for popular support suggesting much work lies ahead for the Liberal party if they wish to once again assume the reigns of power. The election results must have also been bittersweet for NDP leader Lorraine Michaels. While the NDP did manage to win the highest seat count (5) in their history, to lose official opposition status by a single seat must have been painful. Yet such pain is tempered by her party’s share of the popular vote at 25%, a significant improvement of past elections and more than the Liberals. But back to my question: What do the results suggest? For the Dunderdale Conservatives, it appears to be clear sailing. If they run into foul winds, it will be at their own hands and due to any number of items such as mismanagement of the economy, unravelling of Muskrat Falls deal or perhaps due to public sector labour strife. Their biggest challenge will be how to damper the public’s hopes in transitioning the economy for leaner times in the future. Failure to address such a challenge may be their fatal flaw and lead to their demise two elections down the road. For the Liberal party, I am not so sure if they have hit bottom yet which is somewhat alarming given their current position. It will take them at least another electoral cycle or two to re-develop their identity within changed economic times. The NDP’s future looks promising in the short term but the need exists for them to develop a strong rural and regional identity to ensure future success. Canada lost a great leader earlier this week when Jack Layton died. He was 61 years old. Regardless of your political stripe, Jack had become Canada’s leader. He connected with Canadians like no other leader since Jean Chretien, Pierre Trudeau or Rene Levesque for that matter. Many argue that it was only a matter of time before he would have been our next Prime Minister. Now we will never know. But it was not always so for Jack. I recall when he first assumed the leadership of the NDP party and I was less than impressed. Politics and party policy aside, yes, I admired his oratorical skills but the flailing hands and gimmicks during elections left much to be desired. He also seemed tentative when confronting the other party leaders. But Jack was an organizer having cut his political teeth at the municipal level in Toronto politics for many years. It is at the municipal level where representatives are perpetually in “election mode” and it is this organizational drive that Jack brought to the federal NDP party. He revamped its organizational structure, attracted top strategists and moved the party slightly to the centre in order to be more attractive to the average Canadian voter. I do not think Jack came into his own, at least at the federal level, until the 2008 election. It was there he realized that he had to talk directly to Canadians, maintain a steady message and perhaps most of all, tell Canadians you are running to be Prime Minister and not finish second best. After all, people do not go into a voting booth to cast their vote for the second or third place finisher; rather, they want to vote for a winner! And this is where Jack hit his stride. The NDP ran a good campaign in 2008 but to an extent I think this surprised people. They took notice but wanted more. Show us you can be a leader which Jack did over the next few years leading up to the 2011 election. The stars lined up in 2011 for Jack and the NDP. It did not hurt that over the past few years the Liberals were presenting their leader du jour nor did it hurt that the winds had run out of the Bloc Quebecois’ sails. The point is, Jack never strayed from his message, was able to bridge the policy wonk-average Canadian divide and do it all with a style and class we Canadians have not seen in ages. And, he had fun doing it too! He was enjoying himself perhaps realizing that this was it—THE SHOW—and he and his party were rewarded with the largest number of seats the NDP have ever received. The feat is even more incredible given his battles with prostate cancer and hip surgery. What a triumph........ and what a tragedy that he lost his life so soon afterwards. To Jack, I say, Thank You. Thank You for bringing a style and class to politics we badly need. Thank you for fighting for the average Canadian. Thank You......for making a difference! Health and politics: When to step aside? When should our political leaders step aside given deterioration in their health? This is an important question given the events that unfolded this past summer. NDP leader Jack Layton announced he was stepping aside until the fall to focus on his health when he revealed he was battling another undisclosed form of cancer unrelated to his fight against prostate cancer (see http://www.cbc.ca/news/politics/story/2011/07/25/layton-ndp.html). Nycole Turmel has been appointed interim NDP leader. Similarly, Newfoundland and Labrador Liberal Leader Yvonne Jones resigned her position but will stay on to represent her constituents in her riding of Cartwright-L'Anse au Clair (see http://www.thestar.com/news/canada/politics/article/1037020--nfld-liberal-leader-yvonne-jones-resigns-after-breast-cancer-fight). The question of when should one step aside is pertinent given the timing of these announcements. Layton’s came only a few months after the 2011 federal election. The point is, did he know his health was deteriorating and, if so, did he owe it to the people of Canada to inform them of such fact prior to the federal election? We can only surmise on the former and unless he was gravely ill and bedridden, some latitude must be given to him for choosing to continue on and fight the election. In Jones’ case, she announced her resignation barely two months before the fall provincial election in Newfoundland. Did she not know earlier she was not in good health and should have stepped down not only for her health, but for the health of her party and for the people of the province? While Jones’ may have known her recovery from breast cancer was proceeding slower than expected given various factors including the demands of the leader’s job, her case is interesting. When she assumed the leadership of the provincial Liberal party, no one else wanted it. She accepted it on an interim basis then moving to permanent status. She stepped aside to fight breast cancer and came back when she was in better health only to currently resign again. To be sure, resigning two months before an election will have an impact on the party. Jones is an easily recognizable face with a thorough grasp of the issues. She also had added credibility on the health file given her own experiences, something many people can empathize with. On the other hand, it leaves little time for a new leader to prepare for the election though much will have already been done by the party. Once, again, some latitude is required on our part to let leaders decide when it is best for them to step aside—I think Jones’ has earned that much from the people. From my perspective, I do not believe the public should have a complete profile of our party leaders such as that is currently done in the USA. One’s health is a private matter and should be discussed as they so choose. Note that both Layton and Jones have not excluded us but rather publicly detailed their health issues. In other words, they have included us in their battles for as much as they are comfortable. We need to respect that and remember the kind of caring society that Canada has worked to become over the years. It is not like our leaders act in isolation either. They are surrounded by numerous advisors and aides whose job is to ensure work carries on. In the end, people come first. To Jack and Yvonne, best wishes for a full and speedy recovery. 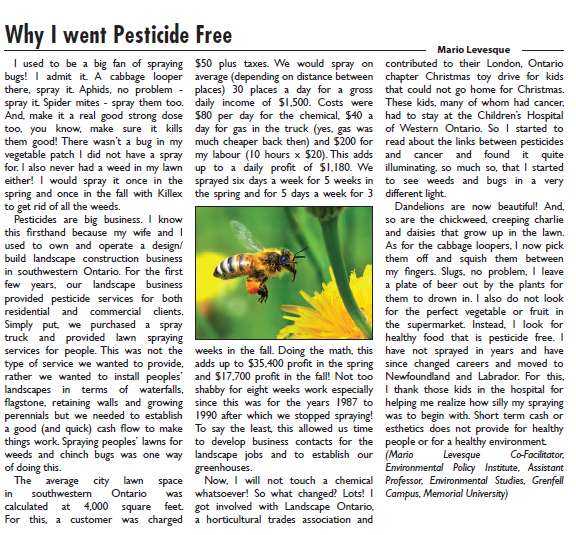 NL pesticide ban: Healthy policy or crass politics? Why announce a limited ban now? The answer to the first question is largely politics. With a provincial election set for October 2011, the incumbent Progressive Conservatives can get some political mileage out of the ban. They are seen as responding to the public’s wishes in that they show concern about our health and at the same time they take away an important environmental plank from their rival NDP party. I am not so sure the public will buy the government’s new found interest in their health given it had consistently ignored calls for a pesticide ban for years. Moreover, the NDP and other political parties are not decimated by the announcement either given the limited nature of the ban—only five lawn chemicals were banned. They can and should advocate for a wider ban for chemicals used in and around the home. And, therein lays the crux. Only five chemicals were banned as shown in Table 1 below which also shows their acute toxicity levels—LD50 values. In other words, long term health effects such as reproductive abnormalities and cancers are not reflected in LD50 values; rather, LD50—Lethal Dose 50—is a value that represents the amount of chemical required to kill 50% of an animal test population when given to them either orally (ingested via the mouth) or dermally (skin contamination). It specifically is a measure of the active ingredient only and does not take into consideration other chemicals as part of a mixture or additives such as wetting agents (chemicals added to mixtures to increase the spread and absorption of active ingredients). Were these added chemicals and wetting agents to be considered, chemical toxicity may increase significantly. Animals commonly used in LD50 tests are rats, rabbits, dogs, birds or fish to name a few. LD50 is expressed in milligrams of pesticide per kilogram of body weight of the test animal (mg/kg) (for birds and fish, the Lethal Concentration 50 is used which measures the part per million (ppm) concentration per 24 hour period in either the water or air that kills 50% of the fish or birds). The important point to note is that the derived value gives us a measure of the acute toxicity of a chemical. A lower LD50 (or LC50) value is highly toxic (less chemical used to kill 50% of the population) and a higher LD50 value is less toxic (more chemical needed to kill 50% of the population). For humans, an LD50 value of 0-50 is highly toxic; an LD50 value of 50-500 is of medium toxicity; an LD value of 500-2500 is of low toxicity; and, an LD50 value greater than 2500 is of very low toxicity. Of the chemicals banned by the Newfoundland and Labrador government (see Table 1), two are of medium oral toxicity (carbaryl, 2, 4-D) with the rest being of low oral toxicity. Dermally speaking, all are of either low or very low toxicity. As a comparison, I have also listed DDT which has been banned in Canada since 1985 with existing stocks sold, used or disposed of by 1991 (almost 30 years after Rachel Carson’s groundbreaking book Silent Spring which documented the deleterious effects of pesticides (DDT) on birds!). Indeed, we were right to ban DDT given its LD50 value of 113 (oral). But, then, why do we continue to justify the use of warfarin, malathion, ferbam, imidacloprid and Ficam which are of equal toxicity or in most cases, more toxic than the banned ones (see Table 1)? Banning these chemicals is perhaps long overdue! Moreover, while the current government needs to be commended for its limited pesticide ban, it nonetheless needs to be extended to all sports fields including ball fields, soccer pitches and golf courses. These are all areas where our children (and ourselves) spend large amounts of time in various recreational activities. Alternatives such as Integrated or Sustainable Pest Management practices are readily available and in use elsewhere to control insects and weeds. Perhaps this is where the opposition parties can differentiate themselves in the upcoming election with an aggressive, encompassing and healthy strategy for the people of the province. Our governments can do better! Public health demands as much. The question is: How will our officials respond to this challenge in the upcoming fall election? Moreover, what will we, the public, demand of them? *Source: Ontario Ministry of the Environment. 1981. Pesticides Safety Handbook. Pesticides Control Section. Information Center, Oregon State University Extension Services. http://npic.orst.edu/factsheets/imidacloprid.pdf. bCornell University. Extension Toxicology Network. n.d. Cyfluthrin. Cornell University. No One Wants to Compromise? Looking at the results of the 2011 Canadian federal election, one wonders whether we are losing the Canadian way. The Conservatives obtained a small but safe majority with 167 seats (155 is needed for a majority) with the NDP becoming the Official Opposition with 102 seats. This is by far the NDPs best showing—far surpassing the 43 seats the NDP obtained under former leader Ed Broadbent in the 1988 election and much better than their 37 seats they held going into the election. The Liberals, on the other hand, were soundly defeated gaining just 34 seats which is drop by more than half the number of seats they held going into the election. The Bloc Quebecois suffered a similar defeat gaining only 4 of 75 seats in Quebec while Green Party leader Elizabeth May finally got elected! 1/ The Conservatives did not run a great campaign but one which shows negativity can win elections. The constant barrage of attack ads directed at Liberal leader Michael Ignatieff both before and during the election did their job. They assassinated his character to the point it did not matter what he did or offered to the electorate. The Conservatives were also the beneficiary of vote splitting on the left in many ridings allowing them to come through and take the added seats to get a majority. This is the same thing that kept the Chretien Liberals in power for over 10 years. 2/ For the NDP, once Michael Ignatieff was no longer seen as a viable candidate due to the acidic attack ads on his character by the Conservatives, people looked for an alternative. A great majority of them, upwards of 2/3, turned to the NDP propelling them to heights never before seen—Official Opposition. The NDP successfully doubled their seats in Atlantic Canada but picked up the vast majority of them in Quebec where voters fled the Bloc Quebecois like the plague. However the NDP surge stopped at the Quebec-Ontario border and did not pick up again until BC. Notice Saskatchewan has gone true blue! It seems the shadow of the Rae NDP government affect the voting intentions of many Ontarian’s. It also helped too that Jack Layton and the party overall had a positive message to sell to the people. They sold hope, no question there (unlike the Conservatives). But they did run an excellent campaign touching on issues that mattered to everyday Canadians—health care, taxes and such. Layton’s speeches were well crafted and equally well delivered. Overall, an excellent campaign. 3/ By all accounts the Liberals ran an excellent campaign. They identified issues and were able to communicate them to the people. Where they got into trouble was that they wavered or did NOT engage with issues of immigration or multiculturalism when they came up—issues which they have owned for the last 100 years! No doubt this cost them votes as it allowed the other parties to claim those issues. At the same time, one questions the selection of Michael Ignatieff as their party leader. Many senior strategists touted him as an excellent leader as he was, for lack of a better term, “brainy”. The problem is, brainy types often cannot connect with the people which were a major issue with Ignatieff. To be fair, Ignatieff did make great strides in connecting with the people over the last year but he simply does not have the populist touch. This is no mark against the man; rather, some people are just that way. The point is, if you want to win an election... You can also question if the populist touch could have overcome the Conservative’s character assassination too. Likely not. It was the perfect storm against the Liberals. 4/ And for Gilles Duceppe and the Bloc Quebecois? Well, let’s just say let’s hope Duceppe stays away this time. In other words, he should have retired long ago. A new leader and new vision is required which is why in large part Quebecers turned to Layton and the NDP in droves! It appears we as a Canadian society are becoming polarized. Both the left and right are solidifying but we are losing the centre (or have lost it temporarily anyway). This is troubling as we seem to be following in the steps of the UK where we see a two party system divided between the Conservatives and Labour and also of the USA where we find the Republicans and the Democrats. The point is: Where is the centre? How do we compromise? Canada is neither the UK nor the USA. We did not come to be as a country like the USA did by fighting; rather, we sat down around a table and said “How can we broker a deal to form a country?” The same thing happened when Newfoundland joined Canada in 1949. There was no war. Rather, we sat down and discussed terms of union. It is interesting to note that at the very time the international community looks to Canada as a beacon of hope, peace, reason and compromise—a third way, we are abandoning these principles in favour of sharp ideological positions from which it is increasingly difficult to compromise. It is “my” way or “your” way...that’s it. We have lost the “our”. And, it does not appear, in my way of thinking, to be for the short term either. Much conservative support comes from older people, we know that, but it also increasingly comes from the youth vote. It appears a generation of compromise has festered to the point people feel secure enough in their positions to no longer need thy neighbor, so goodbye to compromise! This suggests that we will need to wait until the children of the current youth vote mature and challenge the narrow ideological positions of their parents and rediscover and re-invent the liberal tradition—in other words, the Canadian way of the last 100 years! But this will take some time, likely 40-50 years to achieve. Until then, expect more conflict and wild policy changes as we swing sharply from left and right and back again. Did you watch the 2011 Federal Leaders Debate? I sure did but I was largely disappointed with what I saw. Not that I was expecting issues to be truly examined or a knockout punch to be made. No, that rarely happens in debates. Rather, I watch them to see how our federal party leaders connect with the people largely through how they speak, body language and whether they can they get their message across in 10 words or less or in 30 second sound bites. So how did our leaders perform? Stephen Harper was uninspiring. So much so that he could have stayed home and simply mailed the CBC a recorded message for people to see. He quickly sounded like a broken record and he was clearly agitated for the first hour of the debate. This happens when people are in power for some time like the Harper Conservatives—five years to date. They have baggage, lots of it, and it becomes increasingly difficult to defend one’s record. Recall that it was the Harper Conservatives that pledged to clean up government back in 2004 and 2006 yet things are just as bad as they ever were. From senior advisors with criminal records (see Bruce Carson), minister’s significant others with ties to biker gangs (see Maxime Bernier) to lying to Parliament about expenses (see Tony Clement and the $50 million G8/G20 boondoggle for gazebos and fake lakes) and misleading the public about being good stewards of the public purse (see the Conservatives’ blatant and incorrect use of comments made by Canada’s Auditor General Sheila Fraser’s). Little wonder Harper did not want to discuss anything. It is also incredulous the other party leaders did not hammer the message home for viewers: Get Tough on Crime, Get Rid of the Federal Conservatives. Now that would have been a knockout punch. Liberal leader Michael Ignatieff could have made and easily defended this point. True, the Liberals did have the sponsorship scandal under Jean Chretien and Paul Martin but Martin attacked the issue head on—he called an inquiry and dealt with the facts. It cost Martin an election but that is also true leadership, which is, having the gumption to do what is right for the country knowing full well that it will hurt your party. Sadly we see no such leadership under the Harper Conservatives. Quite the opposite actually. When things get tough, Harper shuts down Parliament—twice! When he does not like the questions he limits the number of questions that can be asked as is the current case with his campaign—5 questions max, no more. Interestingly, I was wondering in the debates if Harper would answer the last question since it was the 6th question asked in the English debate. Would he pack his bags and go home? He stayed but reverted to his broken record mantra. But what about our other party leaders? Michael Ignatieff was able to make many points but were they made effectively? While he scored points on issues of crime, values and Canada’s place in the international community clearly stating his party’s position, his answers were at times lengthy. He also stumbled at times searching for words, words that should have easily been at the tip of his tongue. Worse yet, he had no answer for Jack Layton’s attack on his poor attendance, 30%, in the House of Commons. Ouch! That last one really hurt and seemed to catch Ignatieff off guard. Why? As for Jack Layton of the NDP, results are mixed. Layton had some excellent points to make but appeared slow in making them, so slow that the points were lost in the process. Exceptions existed as with his questioning of Ignatieff’s attendance record and highlighting Harper’s willingness to enter a coalition government in 2004—a point from which Harper desperately tried to distance himself. And where was Gilles Duceppe of the Bloc Quebecois in the English debate? What a poor performance! Duceppe is much better than what he showed which came through in the French debate the next night. I do not think it is a language issue as Duceppe is quite comfortable in both languages. It makes me wonder if he has simply had enough of politics. How much longer will he stick around? That is likely more a function of who can effectively replace him than anything. In the meantime, Duceppe soldiers on. So what is my grade on the leaders’ performance in the two debates? My predictions for the 2011 Canadian General Election based on the leaders and their party’s performance to date: A small Conservative majority. If the Conservatives fall apart leading up to election day through more misspending or corruption revelations, I then predict will wake up to a Conservative minority government the day after. The questions are: What do you think? Will you vote? What is your analysis of the debates? What are your election predictions? When the smoke clears: What now? So what to make of Corner Brook Pulp and Paper’s decision to withdraw its proposal to use tire derived fuel (TDF)? On the surface, it seems like this is positive news for public and environmental health. The use of TDF will not be used in the near future. Citizens voiced their concerns and it seems the government listened. But did government listen or is there more to this story that what appears? I am afraid the devil is in the details and my sense is this issue will not go away. It also seems politically motivated. For instance, the government wins in that they did not issue any decision which would have been controversial no matter what they ruled—half the population would have been upset either way. With the mill withdrawing its proposal, no one is "irked" with the government and the issue is taken off the table for the upcoming by-election and the fall provincial election. Hence, the Progressive Conservative Party of Newfoundland and Labrador wins with this decision. However, after these elections, I think the issue will come back. For the company and if the government was going to rule in their favour, they have to wait a few months but they gain government goodwill and likely approval in the future. In case the decision was going to be against the mill, that is the government was going to require an Environmental Impact Statement, then the mill also wins in that it buys them time to address comments that were made at a much cheaper cost. Consider the fact that if the government had requested an Environmental Impact Statement, that would take anywhere from 8-30 months given original studies would likely need to be done and public hearings would have to be held on the issue. This can be expensive and run into the tens if not hundreds of thousands of dollars depending on how matters are approached. By withdrawing the application, the mill can spend far less money, say $15-60,000, to address some of the issues that were raised in the comments to the Minister and resubmit their proposal after the elections. So, the company wins. In the outside chance the government was going to reject the proposal outright, then the mill does not have to be "embarrassed" with the decision either and keeps the door open for further submissions. Keep in mind too, as you likely know, that governments typically contact the business (in this case, the mill) before releasing a decision when matters may be controversial to allow them time to withdraw. I had heard through the grapevine that government officials were meeting with mill officials the day before the mill withdrew its proposal (on Thursday) so I expected this type of decision. All this to say politics is, indeed, alive and well in Newfoundland and Labrador! So, we have a temporary reprieve but the issue will re-surface. An optimist would say perhaps the mill will come back and submit a really great proposal that truly addresses economic, health and environmental concerns--the triple bottom line. Let’s hope this is the case but we will have to wait and see. In the meantime and perhaps more problematic, according to a source of mine, is the fact the mill's boiler is scheduled to be shut down for maintenance in the near future (it may already be shut down). Performing maintenance is good news, but the mill has brought in a replacement boiler with no air emissions pollution control technology on the unit. Talk about a problem yet this is apparently legal in this province. I am not sure about this legality but it does beg to be researched! So, enjoy the temporary reprieve but be prepared for what, I think, will come down the pipeline. Cutting through the tire smoke: Consider the facts before burning tires. We feel compelled to respond to the recent letter by Geoff Rayner-Canham discussing the merits of burning tires. We too like Geoff are ardent environmentalists yet the need exists to examine CBPP’s proposal in an objective, scientific and non-partisan way. CBPP has applied for a test trial to permit it to burn TDF at various rates up to 5% in boiler #7. If testing is successful, CBPP plans to utilize TDF at a rate of 4% in boiler # 7 on an ongoing basis. TDF is a low cost product with high heat content. It will allow the mill to burn lower grade biomass such as bark and sawdust piles which typically have a higher moisture content. More fuel is required to burn wetter material which is cost prohibitive unless the fuel used such as TDF has a high heat content and is inexpensive. CBPP representatives note the use of TDF will replace 10-25% (5,000 -12,500 barrels) of Bunker C oil the mill currently uses (50,000 barrels per year). CBPP representatives note it will save approximately $500,000 to $1,000,000 in the first year alone though savings may vary depending on a number of factors including the price of oil. According to CBPP, public and environmental health risks should be minimal and should be within limits as prescribed by government laws and regulations. So, the dollars and cents argument is sound. The mill will save money yet this does not take into account potential negative public and environmental health effects. First, emissions may be reduced with the use of TDF when temperatures are high enough. To date, research suggests that such reduction in emissions occurs most frequently in cement kilns where combustion temperatures are around 2,600° F. In comparison, the temperature in boiler #7 at CBPP is approximately 1,652°F or close to a 1,000°F lower. Simply put, boiler #7 at CBPP does not burn hot enough to burn off the toxic emissions. Second, zinc emissions should not be dismissed as relatively benign. As was explained to us, zinc particulate is typically quite small and gets lodged into the lungs where over time it typically decreases lung capacity. When combined with sulphur dioxide, your lungs remain affected for a long time. That is, they do not necessarily return to their normal condition when exposure is terminated. From the comparative data from other mills provided by CBPP in their proposal, zinc emissions increased between 6.7 and 391 times over baseline emissions. This depended on the amount of TDF used among other things. This is not insignificant. The problem is compounded by the fact these smaller dust particles reduce the efficiency of the air pollution control technology currently in use at the mill and the fact no updates to the mill’s air pollution control technology have been made since 1995. To be clear, we are not for or against the burning of tires per se. But, we do need to fully consider the facts before making a decision. More research is required before moving to a test trail. Public and environmental health are far too precious to do otherwise. Do we have to burn tires? This is a good question in light of the current proposal to do just that by Corner Brook Pulp and Paper. We have to admit that extracting energy from burning tires is one possible option for scrap tires. But what are some other options? One option is to use shredded tires as part of leachate collection systems in landfills in order to take advantage of some of their unique properties. Tire shreds are lightweight—typically half that of soils—making them an excellent fill material that improves the stability of embankments. Tire shreds are also compactable and pose low horizontal stresses which make them an excellent fill material. Moreover, tire shreds are highly permeable—typically ten times better than soil—allowing for their use as drainage layers in roads and landfills. These properties make tire shreds desirable in landfill construction. For example, research has shown excellent results with their use as leachate collection layers, foundation layers, drainage layer in landfill cap and as an alternate daily cover. In particular, J. Park, J. Kim and T. Edil in 1996 have found shredded tires to be economically and environmentally feasible when used to remove organic compounds from landfill leachate. Basically, tire shreds are good at taking up and holding significant levels of organic compounds thereby reducing their concentration in the leachate (the soupy liquidy waste the exudes from landfills). The fact “the potential leaching of toxic pollutants from scrap tires [in such applications] is minimal” (p. 4) also helps. So does the fact other more recent studies have also found that the bacterial “load” of leachate in tire monofill dumps rarely exceeds that found in surface water while the species composition of the bacterial community is similar to natural surface and subsurface water (see the work completed by A. Leff, C. McNamara and L. Leff in 2007). In a nutshell, a potentially good use for scrap tires may be found. What does this mean for Newfoundland and Labrador? Plenty, especially when one considers the large regional landfills planned for the province. Given the fact a 1 hectare (2.5 acre) landfill requires approximately 300,000 scrap tires to form a 0.3 meter (~1 foot) layer in a leachate collection system (see the work done by T. Edil, J. Park and J. Kim in 2004), Newfoundland and Labrador could easily use its current 1.9 million stockpile of tires and future production for years to come in the construction of these large regional landfills. Here’s an example. The proposed Regional Waste Management Facility site in Central Newfoundland, near the community of Norris Arm North, is to be approximately 369 hectares in size (see the background plan completed by BAE-Newplan Group Limited in 2004). Of this area, let’s say 100 hectares is for the actual landfill with the rest of the area being for roads and buffers and such. Given the above figures, 30 million scrap tires would be required to form a 0.3 meter layer as part of a leachate collection system (100 hectares x 300,000 scrap tires/hectare). This represents roughly an 86 year supply of tires from the province based on 346,000 tires per year collected for recycling in the province. This estimate also does not include possible tire usage at other landfills in the province or for other purposes such as drainage layers in road construction or for rubberized sidewalks. Yes, we can burn tires to extract energy but we can also do other things with them. Perhaps it’s time to move away from simple solutions as the Government of Newfoundland and Labrador’s Waste Management Strategy states and look outside the box for answers. To burn or not to burn? That is the tire question! Kruger’s Corner Brook Pulp and Paper plant has applied to do a trial burn of 1” rubber chips shredded from scrap tires otherwise known as tire derived fuel (TDF) as a source of energy. The mill is also engaging the public in a set of “consultations” so all concerned know the facts. This brief overview highlights and questions some of the facts surrounding the use of TDFs. 1/ Cost Effective Solution: Tire derived fuel is a low cost product with a high heat content. It will allow the mill to burn lower grade biomass such as bark and sawdust piles which typically have a higher moisture content. Simply put, it takes more fuel to burn wetter material which is costly unless the fuel you use such as tire chips has a high heat content and is cheap. CBPP representatives noted burning tire chips as a fuel will replace 10-25% (5,000 -12,500 barrels) of Bunker C oil the mill currently uses (50,000 barrels per year). All told the mill will save approximately $500,000 to $1,000,000 in the first year alone though savings may vary depending on a number of factors including the price of oil. 2/ Safety Concerns: According to CBPP, public and environmental health dangers should be minimal and should be within limits as prescribed by government laws and regulations. 1/ Unknown Public Health and Environmental Effects: While the economic argument is solid, the jury is out on the associated public health and environmental costs. CBPP has stated that tire derived fuels have been used for over 20yrs in a number of places but no data has been presented to indicate that it is safe for people—children, parents, seniors and mill workers alike—in the long term. What is known is that there is a high variability in emissions of particulates, various metals and dioxins and furans, many of which cause cancer, with the burning of TDFs. This variability can be seen in some of the data supplied by CBPP. 2/ Lack of Best Available Technology: Academic literature indicates that with state of the art technology—fluidized bed burners to ensure enhanced/complete combustion and electrostatic precipitators to address toxic emissions—public and environmental health risks are minimized. These are two pieces of technology that CBPP does not have. To the mill’s credit, their boiler was updated in 2007 but it is still not fluidized bed technology. The mill’s smokestack technology has not been updated since 1994. 3/ Importing Tires and Possible Use of Coal: Questions remain as to where all the tire chips to burn will come from. CBPP indicates that the province only has a 3-3.5 yr stockpile of tires after which they propose to burn a lower amount of tires to match the yearly provincial supply. This is a hard argument to believe given how much money the mill will save by burning tire chips. More likely, they will look for tires from other provinces and countries. When asked whether CBPP will import tires, the mill representatives were unclear at the public meetings. On the first night, they eventually stated “No we don’t plan to import tires at this time” but on the second night they said that tire chips will be imported at least for the trial burn. Why the change in position? Will tires be imported or not? This is an important question given the fact the chemical composition of tires varies based on the type of tire in question and on who made the tires. One of the background documents on which the mill’s proposal is based (Sandwell 2005 A) acknowledges this issue and indicates the need to import tires and assesses the yearly supply and stockpile of tires across Canada and several US states. It is this same report that states that the mill could burn coal as a substitute given its similar heat properties. The public health effects of burning coal have long been known and are not very good, something the province acknowledges in its move to develop other sources of energy to replace its own coal generating station in Holyrood. 4/ Citizens Not Informed When Tire Test Burns Done in May 2005: CBPP conducted test burns using tire chips in 2005 yet citizens were not informed of this fact at the time nor was it acknowledged at the public meetings. The 2005 test burn is supplied as reference charts in CBPP’s proposal and admitted to by representatives when asked after a presentation. Smokestack emissions were not monitored during the test burns according to government officials. Why was the public not informed about the 2005 test burns and why were emissions not monitored? 5/ What About Recycling Options? : Recycling options have not been thoroughly investigated. These include tire chips used in the construction of roads and highways, as backfill during housing construction, as part of a layer to cover garbage dumps, as part of leachate management systems in garbage dumps (good opportunity here since the province is looking to build 3-5 super dumps), rubberized concrete sidewalks used in many cities (Calgary, Welland, Toronto, Barrie to name a few) and in many other products such as automotive parts and animal comfort mats. Investigation into these alternatives is required to assess their feasibility, health and environmental properties when compared to burning tire chips. 6/ Consistency With Government of Newfoundland Stated Goals: CBPP’s proposal appears inconsistent with the government’s stated goals. For example, in its Waste Management Plan, the government states that Newfoundlanders have to stop taking the easy path with its garbage by burning it; rather, it needs to develop long term solutions. Burning tire chips also works against the provinces 2007 Energy Plan which states that the province is working towards replacing coal generated electricity with clean energy sources (e.g. water). Lastly, burning tire chips does not further the provinces climate change plan which seeks to develop clean sources of energy for the people of the province. Given these facts, questions and issues, CBPP’s proposal merits further study over the next few months before proceeding to a test trial to ensure public and environmental health does not suffer as a result of burning tire chips at the mill. What a party! Now what for New Brunswickers? New Brunswickers awoke Tuesday morning to find they had done a little house cleaning. Actually, they did a lot of house cleaning. The incumbent Graham Liberals were swept from office in favour of David Alward’s Progressive Conservatives. The final seat count was 42 for the Progressive Conservatives and 13 for the Liberals. In other words, the final result was not even close in terms of seat count. Does this election result matter? This is the question the people of New Brunswick must be asking themselves. An argument can be made that the people got rid of a government that was increasingly out of touch with the people. This was certainly the case with the Graham Liberals’ attempt to sell NB Power to Hydro-Quebec which eventually fell through. One can also point to proposed changes in the education sector related to French immersion and the reforms to post secondary institutions. No doubt these “missteps” contributed significantly to the Liberal government’s downfall. Questions remain, however, as to whether Graham’s reform initiatives were indeed “missteps” or a bold attempt to address the provinces finances. Recent figures peg the province’s deficit at around $750 million dollars with an accumulated debt north of 8 billion dollars. While perhaps poorly thought out, at least the Graham government’s initiatives were some ideas on how to deal with the province’s financial situation. It must be noted that change is difficult at the best of times yet significant change to address big problems is even harder. Those who initiate such dialogues are often the first to suffer the backlash such as losing an election. The Graham government’s election loss aside, one need look no further than Bob Rae’s NDP 1995 election loss to the Mike Harris Conservatives as evidence. The Rae government’s efforts to initiate a dialogue with stakeholders to address the province’s economic situation proved unsuccessful as they were promptly turfed from office at the first available chance by a government who promptly came in and instituted their program with little stakeholder input. Does the same fate await New Brunswicker’s with the overwhelming majority they gave David Alward’s Progressive Conservatives? Only time will tell. The point is that change will come as the overspending cannot continue. It can only be hoped that the financial “conversation” begun by the Graham Liberals spreads beyond the vestiges of government offices and becomes more inclusive of the people’s wishes. Yet therein lies the rub. The dire financial situation facing the province was not a prominent issue in the election. Leaders—all leaders—generally avoided the state of the province’s finances during the campaign except to make numerous spending promises. It seems they adopted former Prime Minister Kim Campbell’s ill-fated comments in the 1993 election when she stated that election campaigns were no place to discuss complex issues. People deserve better from their leaders and New Brunswicker’s deserve better from their government.